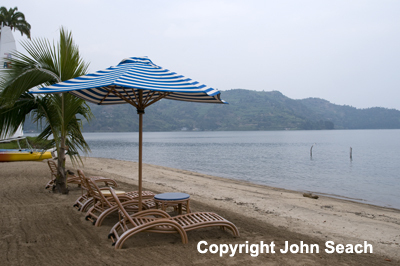 Lake Kivu is located about 18 km S of Nyiragongo volcano summit. The lake covers an area of around 2400 sq km, the maximum depth is 485 m and the water volume is 500 cubic km. Water mixing extends from the surface only down to a depth of about 50 m. This means that a large quantity of gas remains dissolved at depth. The lake contains 250 cubic km of carbon dioxide, 55 cubic km of methane, and 5 cubic km of nitrogen. Kabuno. A risk from lava entering Lake Kivu is the disturbance in the stratification of the lake, resulting in a lethal cloud of carbon dioxide and methane around the lake. Large quantities of methane gas are dissolved below 275 m in the waters of Lake Kivu. In Lake Kivu the methane is held in water layers which form a dynamically stable density stratification. Carbon dioxide concentration in Lake Kivu is 8% of saturation at a depth of 180 m. Methne concentration is 43 % saturation at a depth of 180 m. This is much lowere than Lakes Nyos and Monoun in Cameroon, which reached saturation before the gas eruptions in 1984 and 1986.
several decades, according to a scientific report in 2002.